The Cardinals have removed the interim tag from manager Mike Shildt and given him the permanent job in St. Louis, the team announced on Tuesday. The new manager gets a three-year deal through 2020, according to Derrick Goold of the St. Louis Post-Dispatch. "We are pleased to name Mike Shildt as the St. Louis Cardinals manager," owner Bill DeWitt Jr. said in a statement released by the team. "Mike is a veteran member of the Cardinals organization who has demonstrated strong leadership and coaching traits, formed by his many years of experience in the game, including his 15 years in the Cardinals system. 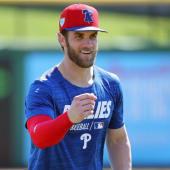 The team's focused, high-level style of play under Mike is a standard that his teams consistently displayed during his prior years in the minors, and it has continued here at the Major League level." Shildt took over as interim manager of the Cardinals on July 14 following the firing of Mike Matheny. Under Matheny in 2018, the Cardinals were 47-46. Since Shildt took over, though, the team has gone 26-12 (.684) and presently occupies the top wild-card spot in the National League. Shildt, 50, has filled a variety of roles within the Cardinals organization across several years, including multiple seasons as a successful minor-league manager. Shildt joined the major-league staff in 2017 as a quality-control coach and then third-base coach. In 2018, he served as Matheny's bench coach before replacing him as manager. "Over the past 15 years, Mike has been mentored by many great baseball men including George Kissell, Tony La Russa and Mark DeJohn," said Cardinals' president of baseball operations John Mozeliak, also in a statement released by the team. "Now he has an opportunity to share his insights throughout the entire organization." Shildt since taking the reins has been much more aggressive in going to the bullpen earlier in the game, and he's also installed Harrison Bader and Kolten Wong as lineup regulars. Defensively, the Cardinals have improved despite, it would seem, employing the shift much less. The multiple reports of clubhouse discord, a fixture in Matheny's final weeks, have also evaporated since Shildt's ascension. As a result of all of that and very likely some good timing on Shildt's part, the team has improved at every facet of the game. Despite the usual concerns about Shildt having never played at the professional level -- he topped out as an infielder for UNC-Asheville from 1987-90 -- he's thus far proved adept at running a major-league clubhouse and dugout. Shildt is the 50th manager in franchise history since the team joined the National League in 1892.